The enticing island of Gran Canaria has a special hold on my psyche. Over many visits to this "Isla fortunata", it has brought to me, at various times, consolation, healing and fulfillment. This time I will try to communicate to you the special feelings I have for this isle, on a two weeks' trip full of interesting - I hope - vistas and events. 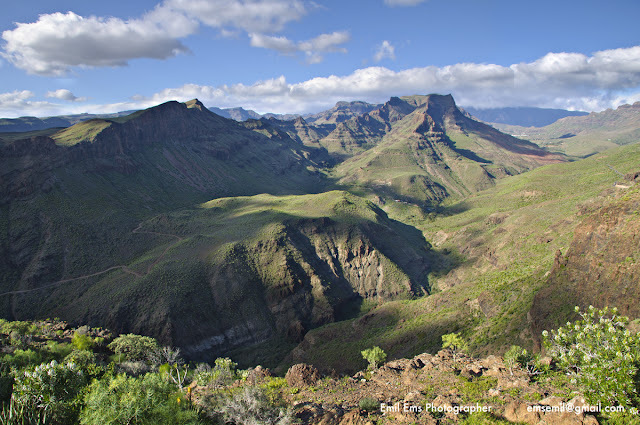 Yesterday was the first of, I hope many, days spent hiking in Gran Canaria’s interior. I had originally booked for a trip to the top of Roque Nublo, an intriguing promontory that was sacred to the indigenous people of the island (the “Guanches”). However, the tour was changed, due to severe weather conditions. Instead, the hike was redirected towards visiting some charming places where almond trees are blooming. 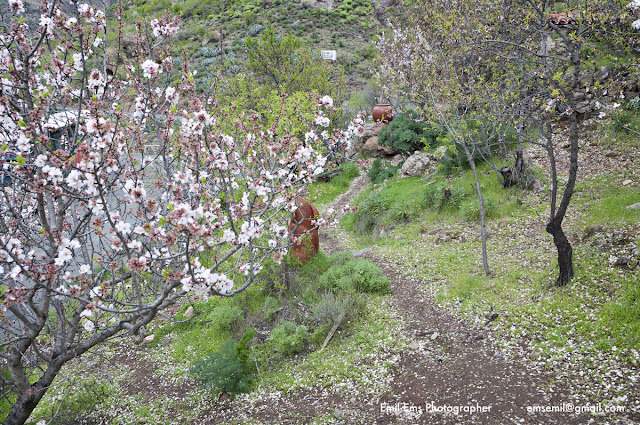 This sounds easy going, but you should realize that almond trees are growing only between 800 and 1200 meters’ altitude, so hiking to see them is not exactly like walking on the beach. You would be wrong in believing that these trees grow in large plantations, easily reached, for grooming and harvesting purposes, by the peasants owning them. In fact they are clinging on to hazardous slopes, in volcanic terrain that is rather cumbersome to penetrate. Neither are the flowers of these trees opulent like, for instance, the cherry flowers adorning Washington DC (described in my blog post “Washington in Bloom"). That notwithstanding, the trees are a pleasure to behold at this time of the year, being full of delicate flowers with fragrant and aromatic smells. 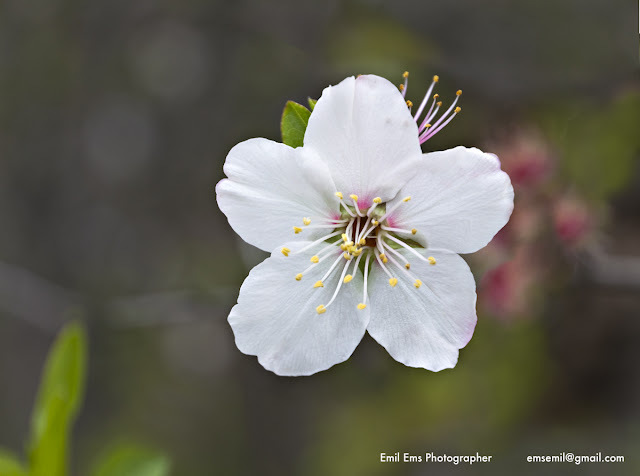 It may interest you to hear that almond flowers come in two distinct colours, white and pink. Trees with white flowers bear almonds sweet to the taste, whereas those with pink flowers carry a bitter variant, full of poisonous cyanide. The only way to know which type of almonds you are harvesting is to cataloguing each tree according to its flowers and keeping book of all of them until it is time to get the mature fruits off the trees. Come to think of it, I may have confused the colours. Better check with your friendly peasant when helping him harvest the trees, so you don’t collect the wrong variant! The trip was organised by Happy Hiking, a hiking company where José Vanderveken, a long time friend, is a main responsible. With José I have criss-crossed the island numerous times already. Despite his exotic pre-name, he is a cordial Belgian, much appreciated by his many thousand customers. This time we were too many hikers for one guide so he split up the group in two. The group in which I partook was led by another old friend, Manfred. He happens to be a countryman of mine; even better than that, he was born in the very same Duchy that I call my native land, venerable Styria. As an aside, did you know that the very first novel having a vampire as main character had its tale located in Styria, more precisely in the two castles of Riegersburg and Gleichenberg, close to my birth place. Moreover, the vampire in question was a woman, not a dreary old count from Transsylvania. The book is called “Carmilla” and I can recommend it to aficionados of vampire novels. I see that I am starting to ramble into serendipity, a question of old age no doubt. Back to the main thread! Our hiking tour started in light drizzle and rather cool air. However, we treaded mainly uphill and the exercise soon warmed us up. We started in the mountain village of Ayacata and headed upwards, more or less straight on, towards the foot of Roque Nublo. Our reward came with the several stops we made and the views this allowed us to take in. One place was my favourite; it provided a broad view of the valley of Ayacata, with almond trees spread out thinly around the village. By then the rain had stopped and the sun started to lift our spirits. Upon arriving at the foot of Roque Nublo, no cloud was in sight anymore and we got a nice view of this red coloured finger the island is giving the Almighty. More about this, I hope, in a future blog, if weather conditions become more stable and enable a hike all the way up to the top without risk. Instead, we retraced our steps and continued the hike in the region around Lake Chira, away from the civilised valley of Ayacata with its almond trees and instead losing ourselves in the friendly pine forests adorning most hills and slopes in the upper part of the island. 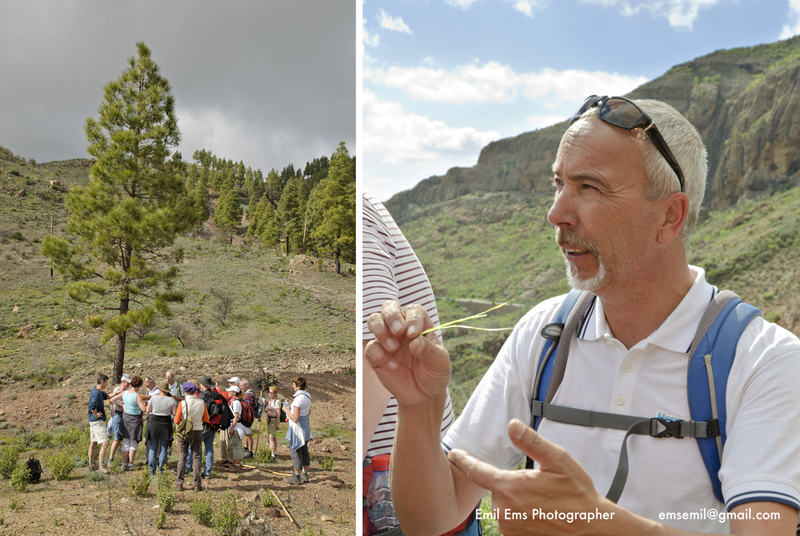 As explained to us by Manfred, most of the pine trees have been planted during the past 50 years, in order to reforest an otherwise barren interior, suffering from the effects of ruthless logging during the early Spanish days. Interestingly, the indigenous Canarian pines get their water supply exclusively from the air. Trade winds supply the upper regions continuously with wet low hanging clouds. The pines, with their long sharp needles, are “milking “ the clouds and get all their moisture from them. The surplus is running to the ground and benefitting other vegetation growing around the trees. Needless to say, the pine forests are essential for providing a stable water supply also for the agriculture on the island. Towards the end of our tour, when the bus was bringing us back to civilisation, we made a last stop at one of the famous overlooks, from which one can admire the “Eagle Pass”, the utmost challenge for any serious bicycle user. Here came for me the glorious finish of our trip. The rocky cliffs around Eagle Pass shone in a serious green, lushly covered with vegetation after the heavy rains as they were. I am glad that I came to Gran Canaria to witness this rare splendour. Have a look at the picture below. Isn’t the green almost outerwordly? To get to grips with the scale of those "hills", double click on the picture to get it larger and try to locate the village of Fataga on its upper right, just behind the last rise and below the blue range on the horizon. Still, don’t let yourselves be fooled thinking that these are the mountains of Gran Canaria. These are merely the FOOTHILLS, standing like sentinels guarding the Caldera, along the rim of which are the main tops, ranging up to 2000 meters. With a bit of luck, you will be able to join me in climbing the second largest of those peaks coming Saturday. Let’s keep our fingers crossed that it does not rain that day and that the trade winds will blow off all clouds from the island when I will be standing on top of Pico Campanario and taking pictures for your benefit. the Almond blossoms look beautiful! I didn´t know how they looks like, but I´ve always liked the taste of almonds. Your pictures are fantastic! I also liked your picture gallery of "Walking the beach". I hope you don´t get embarrased by all my compliments, which a typical Swede would be, saying: "Oh no! They are just simple and common, no fuzz about them, you are exaggerating" etc. No, that´s wrong! 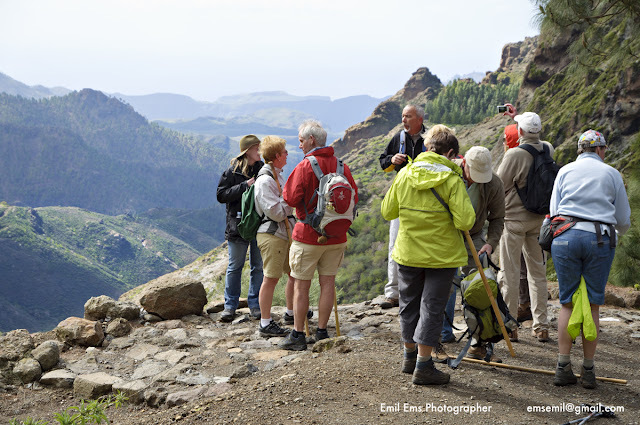 They are reflecting the splendour of what you are experiencing at Gran Canaria right now! Thank You for sharing the experience! vielen Dank für die schönen Gran Canaria Fotos. I so appreciate the photos. You are a great photographer. I am humbled by your compliments. But it is true that those pictures take some effort to develop and to get on the internet. I am shooting raw and developing the pictures myself on the basis of the raw computer data that leave my trusted Nikon. Still, for pictures as clear in colours as those on the present post you have to be lucky to get the right light conditions. This was a special day for me as photographer, I can tell you. Let´s hope that future hikes provide me with the same proficient conditions. I am a retired civil servant and academic, with a long and challenging career in Sweden and abroad behind me. Upon retirement, I moved back to Stockholm, Sweden, and re-invented myself as photographer, author and travel journalist. My blogs and my website show my production in that regard.